Near the Bhimeshwar Temple is a small hill known as Garg Parvat, which is the source of river Gargi, also known as Gola Nadi in the region. About 2 km from Bhimtal is Nal Damyanti Tal, a small natural lake. It is believed that the palace of famous king Nala drowned into this lake. It is a very sacred place for the dwellers of the region. The hill of Karkotaka is supposed to be named after Karkotaka, a mythical cobra. The hill is famous for its Nag temple in the region and on every Rishi Panchami thousands of people visit the temple and worship the Nag Karkotaka Maharaj. This is one of the famous nag temples situated in Uttarakhand region. The Museum of Folk Culture (Lok Sanskriti Sangrahalaya) housing collections of folk paintings and ancient wooden artifacts. There is a 17th century Bhimeshwar Temple complex along the 40 feet high dam. 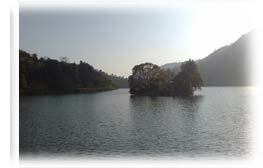 About 2 km from Bhimtal is Naukuchiatal is picturesque & mystique lake with 9 corners or or the 'nine-cornered lake'. Surrounded by dense forested hills on all sides it provides solace from the maddening rush of the plains. Naukuchiatal is nourished by an underwater spring, which keeps its water levels high. Naukuchiatal is the deepest lake in the Lake District of India (Nainital) and lost in acres of oak forest in the lesser Himalayas. Naukuchiatal attracts migratory birds, which makes it a bird watchers paradise. Lakes, fishing, trek, Paraglading and mountain biking are major attractions. About 5 km from Bhimtal is Sattal - Saatal Literally meaning seven lakes all the group of small lakes nested together, about 23 kms from Nainital at an altitude of (1370 MT) still untouched by modernisation - one can see the natures beauty at its best. 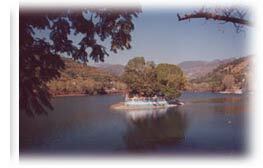 Sattal is one of the few unspoiled and unpolluted freshwater biomes in India. These lakes are a paradise for migratory birds. About 22 Km away is Nainital - Nainital boasts of Nine different lakes, shares its boundary with one of the most visited National Parks (Corbett National Park) in the country, has Lush Green Valley view of the Hills and lower forested ridges and obviously is part of the Mighty Glittering Himalayan Range. Nainital is post-card pretty and has wonderfully clean air to match. There is also a romantic air about this beautiful hill-station. Fill this form Contact Here and will Call You Back !! !